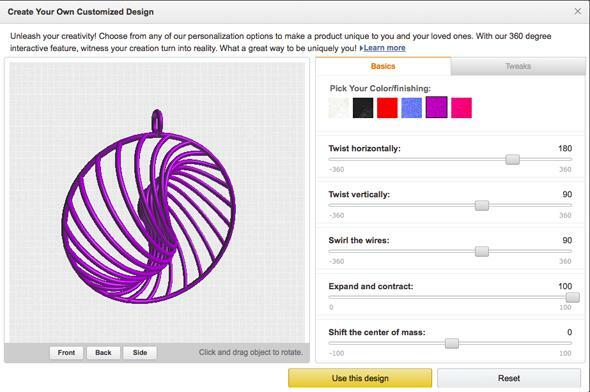 Amazon's new 3-D Printed Products store sells more than 200 customizable items. There’s so much twisting and swirling that you can control in this pendant. If you want to 3-D-print some My Little Pony figurines of your own design, the Internet respects that and will take care of you. But that might sound a little too (what’s the right way to say this?) niche for some people. So Amazon now has a 3-D Printed Products store, too, offering more than 200 customizable trinkets. You might be thinking that this sounds like Shapeways, the expansive playground for 3-D-printed goods that’s been around since 2007. And you’d be right! But competition is finally heating up with 3-D printing, and new services include an iOS app from eBay that allows customers to design items for 3-D printing while on the move. Amazon’s store offers designs for jewelry, bobbleheads, smartphone cases, and more that can be tweaked and customized by the buyer before printing. But Amazon isn’t doing the actual manufacturing here. Instead, the 3-D Printed Products store is a portal where third-party sellers can hawk their wares through Amazon’s recognizable interface. Amazon getting in on the game doesn’t change the limitations of 3-D printing or help answer the open question of where it will actually go in terms of personalized manufacturing. But the more competition there is in the space, the quicker it will become clear what people are looking for.